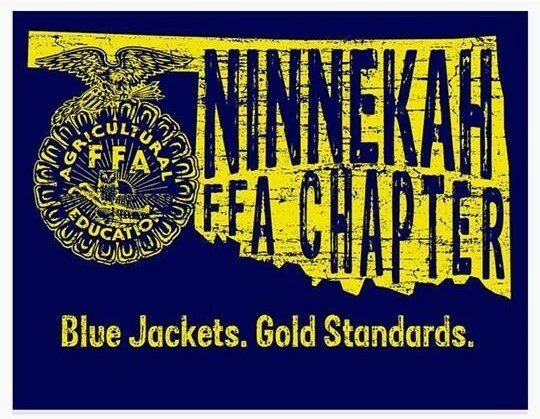 The Ninnekah FFA chapter of Ninnekah, OK, has been recognized in 2018 National Chapter Award Program from the National FFA Organization. The program recognizes outstanding FFA chapters from throughout the country that actively implement the mission and strategies of the organization. These chapters improve chapter operations using the National Quality FFA Chapter Standards and a Program of Activities that emphasizes growing leaders, building communities and strengthening agriculture. Chapters are rewarded for providing educational experiences for the entire membership. Chapters that received star ratings during judging July 22-27 will be recognized at the 2018 National FFA Convention & Expo, Oct. 24-27 in Indianapolis. All star FFA chapters receive honors made possible by corporate sponsor John Deere. "Feeding some 9 billion people by mid-century brings with it unprecedented challenges for today's farmers," said Amy Allen, manager, national corporate contributions for John Deere. "The skills and experiences learned through the National Chapter Award Program will help meet the critical needs."